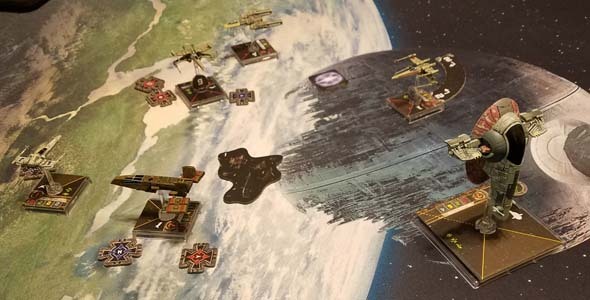 With Fantasy Flight having recently announced a second edition of its X-Wing miniatures game, I thought I'd take one last stab at reviewing content from the original release (first edition). I'm not sure if I'll end up buying any second edition content, since I've already invested heavily into the first edition. There will be optional "conversion kits" that you can purchase for each faction (Rebels, Empire, and Scum) that will make all the first edition expansions forwards-compatible with second edition. That's a nice gesture from Fantasy Flight, as it means that the hundreds of dollars that I've invested into X-Wing won't be rendered moot overnight. I guess my decision on whether or not to purchase will be based on whether the new second edition mechanics, rule changes, and balance adjustments feel worthwhile. Anyway, let's talk about the third (and final) faction from the first edition of X-Wing: Scum & Villainy. Despite having previously said that I wasn't interested in the "Most Wanted" expansion for Star Wars: X-Wing, we did end up buying it after all. My girlfriend was interested in some of the ships offered by the "Scum and Villainy" faction, so we picked up the "Most Wanted" set along with a couple of extra expansion ships compatible with the Scum faction. Most Wanted acts as a "base set" for the new Scum and Villainy faction. 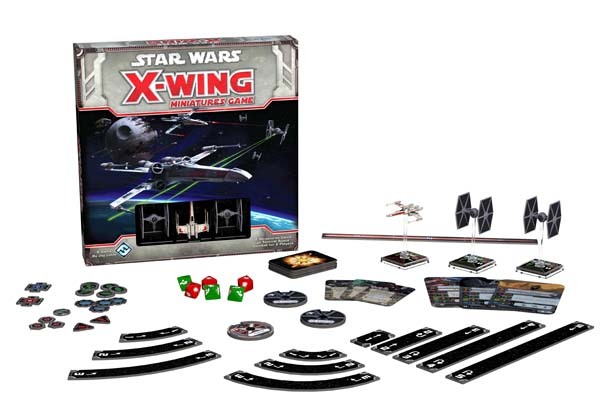 It's still an expansion to the core X-Wing game, and so it does not include maneuver templates, dice, and other core components. Fantasy Flight still wants to nickel-and-dime you into paying extra for those components. A player interested in Scum could, hypothetically get by without investing in this expansion. It includes a variant of the Y-Wing and two Z-95 Headhunters with alternate paint schemes. Both of these ship types are already for sale as stand-alone expansion ships for the Rebel faction, so there isn't anything terribly new or innovative here. You can't play 1 v 1 v 1, but you could have Scum team up with another faction. Unfortunately, despite adding a third faction, Most Wanted (and the other Scum & Villainy expansions) do not add rules for a third player. I'm not quite sure how having a third player would work within the game, but it would have been nice to have been able to include more friends. You can, of course, add a third or fourth player using the core set's team rules. This could allow (for example) a 100-point rebel squad to face off against a team of a 50-point imperial squad and a 50-point scum squad (or larger fleets, if you so desire). But there are no rules for a 50-point vs 50-point vs 50-point, three-player free-for-all. To make things more interesting, you could maybe create a scenario in which Scum are teamed up with another faction, but the scum player and their teammate actually have conflicting goals or objectives. For example, I could imagine a scenario in which the Scum and Rebels team up against a single Imperial player to do something like steal some Imperial cargo pods. While the Rebels and Scum would be working together to defeat the Imperial player, they might also be competing for who steals the most cargo. Or something like that. Those limitations aside, I actually do recommend picking up Most Wanted if you're interested in the Scum & Villainy faction. Most Wanted is actually a surprisingly content-rich expansion and provides pretty good value for its price. It's the same price as the core set, and includes as many ships and plenty of upgrades (including the coveted "Bomb Upgrade" for Y-Wings). In addition to the three fighters and their associated pilots, this expansion also includes alternate pilot card for other existing ships. You can use the new scum pilot cards with any Y-Wings or Z-95 Headhunters that you may already have in your collection, and you can also use the new Y-Wing and Z-95 models with the older pilots in your existing Rebel fleets. Most Wanted includes alternate Scum pilots for any Firespray or HWK-290 ships you may already own. This set also goes a little above-and-beyond by including alternate Scum pilots for some other ships, like the HWK-290 freighter and the Firespray (including a pretty badass new Boba Fett pilot). You should have no trouble filling out a 100-point (or maybe even a 150-point) squad with just the pilots and upgrades included in this box, assuming that you already have some of the other Scum-eligible ships available in your collection. And if you don't already have a Firespray (Slave I), then I highly recommend that you pick one up! This past couple years, my girlfriend and I have been getting very into the Star Wars: X-Wing miniatures game. We've also been converting some of our friends into avid players as well. After sitting on my shelf for several years with only a couple play sessions under its belt, the set has been getting played every few weeks with regularity. As such, we've also been investing more and more into additional expansions beyond the set that I initially bought. Late in 2016, my local board game store put its Corellian Corvette expansion on sale, so I went ahead and snatched up a copy of that huge, epic expansion ship. The following year, I went on to pick up the Imperial Raider huge expansion (also on sale).. 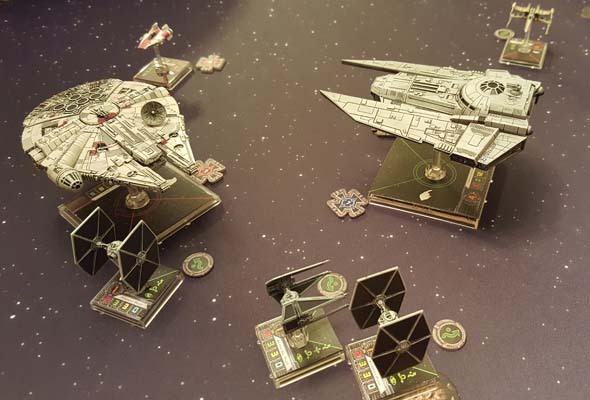 It took a while for these two ships to get much play though (seriously, they were sitting around for years), since they don't slot into the X-Wing core rules as easily as other expansions do. Playing with the huge ships requires increasing the scale of the X-Wing game considerably. The huge ships, by themselves, cost well over 100 fleet points. As such, the basic 100-point fleets go out the window for the epic-scale matches. Instead, 300 fleet-building points are recommended if any epic ships are in play. In addition, a larger play area is needed for most epic scenarios. 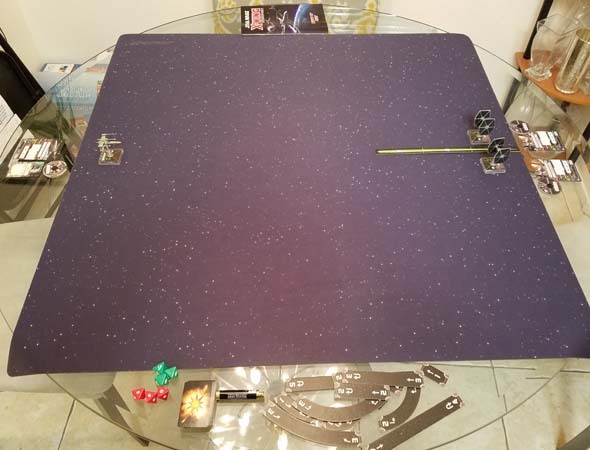 If you bought a play mat for X-Wing, you might need to invest in a second mat as well (and they ain't cheap). I've had a busy couple of weeks of movies! Three movies in the past two weekends, and planning on seeing Spider-Man: Homecoming in the next couple days. 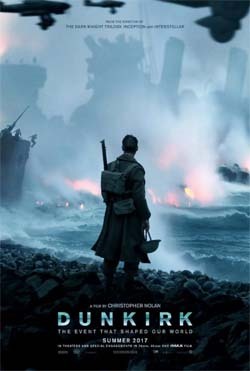 But first, while trying to keep ourselves entertained in Des Moines, my girlfriend and I decided to kill a couple hours at the movies and checked out the newly-released war movie from Christopher Nolan: Dunkirk. I'll admit that it took me a little while to figure out this movie's chronological structure. 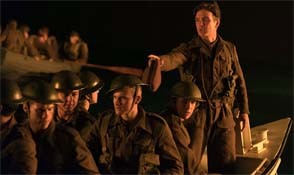 Director Christopher Nolan decided to edit the movie into a non-sequential order, in which individual scenes jump back and forth between points in the movie's timeline (sometimes to show the same event again, but this time from a different point of view). There's three main storylines running in parallel: a pair of soldiers trying to catch a boat off the beach, a pair of pilots hunting down German bombers, and a civilian yacht captain setting sail to help rescue the stranded British army. 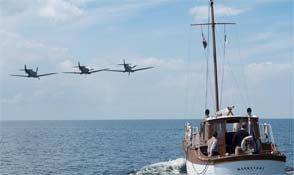 Early in the movie, the scenes with the soldiers take place at night, and the scenes on the planes and in the yacht take place during the day. At first, I thought maybe this was some kind of time zone difference. Like maybe the scenes on the boat were taking place sufficiently east that the sun had already set; whereas, the planes were flying far enough west that the sun hadn't set yet. This wasn't the case. The movie was, in fact, shifting between an aerial pursuit taking place during one afternoon and the boat escapes that happened the night before (or several nights before). Maybe I missed something at the beginning of the movie that made this all more clear? I didn't have any trouble following along with the non-linear, compressed time in Inception, but this movie threw me off a tiny bit simply because I wasn't expecting it. Once I realized how the movie actually worked, it was easy to follow along with each of the individual threads, and to start to see where and how they intersected. Not a deal-breaker in any way. By the end, everything comes together quite nicely. The early movie cycles between the day of the evacuation and conflict from the night before. 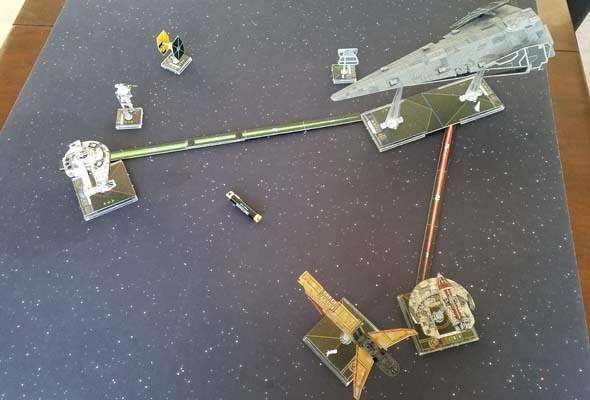 I really enjoy the Star Wars: X-Wing miniatures game, and have been playing it on and off for a few years now. Unfortunately, the core set is very lacking in variety, and so the game really needs to be expanded in order to be fully enjoyed. There's a myriad of expansions available, and they can be pricey. A single fighter ship expansion retails for $15, large ship expansions retail for $30-50, and the huge (epic) ships can cost as much as $90 or $100! If you get into this game, be prepared to spend money. I never got into much of the Star Wars extended universe, so my interest in expansion ships has been mostly limited to content from the classic trilogy. This allowed me to be at least somewhat frugal in my early expansion purchases, but I still tried to find as much variety as I could. At the time of this review, I own (and have played with) the following expansion: Millennium Falcon, Slave I, Lambda Shuttle, VT-49 Decimator, X-Wing, A-Wing, TIE Fighter, TIE Advance, TIE Interceptor. I also recently purchased the Corellian Corvette expansion (the foot-long huge ship that stands on two bases), but I've yet to have a chance to play it. I'm also interested in trying out the Imperial Raider, which (as I understand) is a ship that was conceived for the X-Wing miniatures game and then also ported into Armada. I also haven't played the "Most Wanted" expansion, which adds a third faction and could hypothetically allow for three-player games. I don't think that there's an official ruleset for a three-player deathmatch though, so even with a third faction, you'd probably just be playing in teams. There's really not much to be said about the small fighter expansions, as they play (mostly) the same as the X-Wings and TIE Fighters that come packaged with the core set. Each ship comes with its own special abilities that add some nuanced differences to how they play, but they still play similarly at fundamental levels. Be very aware of each ship's Pilot Skill, as the risk of collisions dramatically increases with more ships. There's two versions of this game available now. The original one was released back in 2012 and was based on the original Star Wars trilogy. With the release of The Force Awakens in 2015, Fantasy Flight released a variant core set based on the new movie. The variant set includes miniatures based on the new Resistance X-Wings and First Order TIE Fighters, as well as some revised rules. I haven't played the variant set with the revised rules, so this review will focus on the original release of the game. My understanding is that the rule changes in the updated version do not alter mechanics, but rather it makes some clarifications for some circumstantial edge cases. If I ever do get a chance to play the revised rules, and find that they substantially alter the game, then I'll either write a separate review of that, or I'll add to this review (depending on how extensive the changes are). I've had this game for a few years, but didn't play much of it over that time period. Lately, however, my girlfriend and I have gotten really into it -- trying to play a game every weekend or two -- and have been buying lots of expansion ships. So I decided that it was time for me to finally get around to reviewing the game. Miniature games are a dangerous thing to get into. 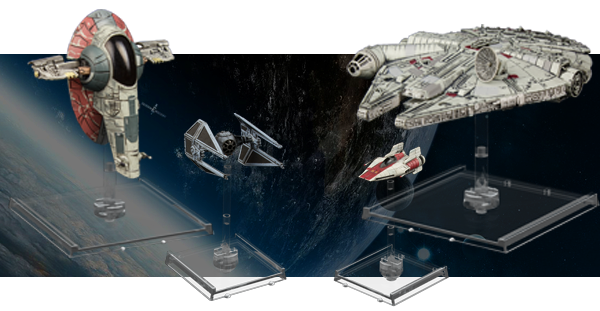 The core set for X-Wing contains only three ships: a single X-Wing and two TIE Fighters. Without expansions, this leaves the game with relatively little replay value, as there's only so much you can do with such a small roster of ships. There's a handful of pre-made mission scenarios and character cards that can add a bit more variety. The ships themselves are very high quality models - nearly collectible-quality models. Screw having a box, when you're not playing the game, you can display these miniatures on a shelf or in a curio cabinet somewhere! Other components in the set have good production value, which is one of the trademarks of Fantasy Flight games. The game has no board, but is played on any 3'x3' playing surface. Fantasy Flight does sell optional play mats. Since this is a miniatures game, there is no actual game board. Instead, you'll need a 3 foot by 3 foot playing surface for the play area, plus some extra room for ship cards and components. Fantasy Flight sells play mats with various patterns, along with numerous other accessories. You can also get away with a solid black sheet of 3'x3' felt or cloth from your local craft store, or a bigger sheet if you want larger play areas (you can fold a sheet of cloth to any size you need). In lieu of such a play surface, the game box includes a set of 4 cardboard "corners" that you can use to delineate the borders of the play area. The play area can also be decorated with asteroids or other cardboard obstacles that come packaged in the game. The game itself is a four-phase process. 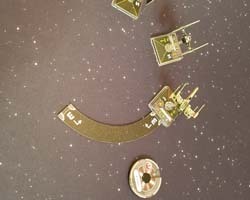 In the first phase (Planning Phase), each player secretly selects a maneuver for each of their ships using a cardboard dial. This maneuver will determine the ship's movement during the following phase. The second phase is the Activation Phase, in which each ship executes its planned movement. Each ship has a pilot assigned to it, which has a skill level on that pilot's card. Ships are moved ("activated") one at a time in ascending pilot order (lowest skill pilot goes first). The ship's chosen maneuver is revealed, and ship movement is handled by slotting a cardboard maneuver template into the front of the ship's base, picking up the ship, and finally slotting the back of its base at the far end of the maneuver template. In general, movement is a pretty easy mechanic to execute.